So finally Hobbyboss have gotten around to releasing this well-anticipated little kit. I first saw plans for this over a year ago, and have been very much looking forward to the release. In many ways I think this kit is a bit of a tough one for Hobbyboss, because it is basically a civilian vehicle. To my knowledge, they have never done any like it before. 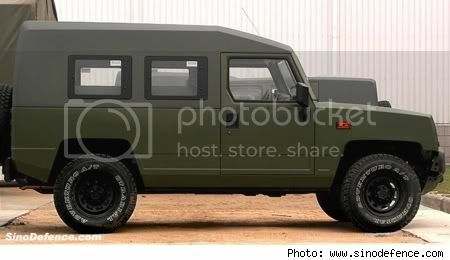 In addition, a vehicle as small as this one needs to be well-detailed, not least because in most configurations, the interior is very visible (unless the rear shell is added). So what have Hobbyboss presented us with? 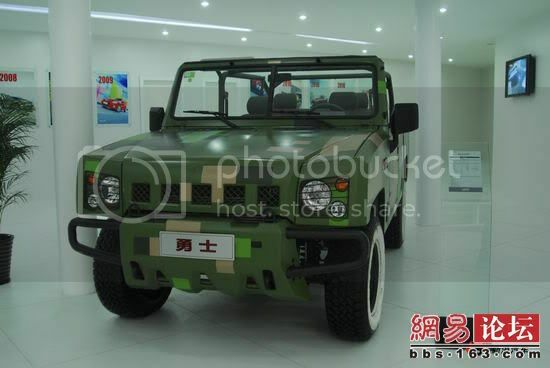 the BJ2020— which was basically a Chinese UAZ-469B, and known most popularly as the “Chinese Jeep.” Since 2008, the BJ2020 has been phased out of PLA service, but I doubt it is fully gone, and probably remains in service with some units. And I would venture a lot of them have been passed on to various Chinese police units. 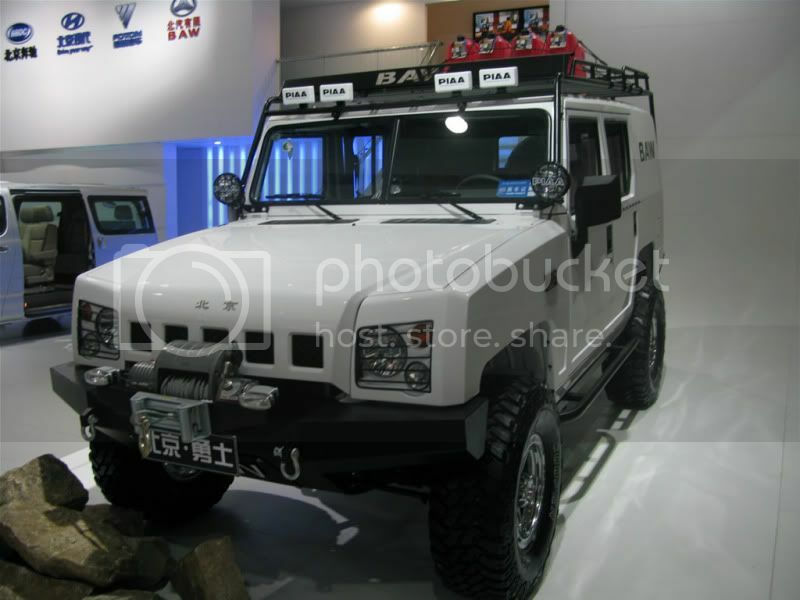 Beijing Automotive Works is the designer of the BJ2022JC Yongshi (勇士 or “Brave Warrior”), and some sources say much of the work was based on western automobiles, principally those of Daimler-Benz (and until 2010, Chrysler) as BAW has a long-standing co-operation agreement with them. 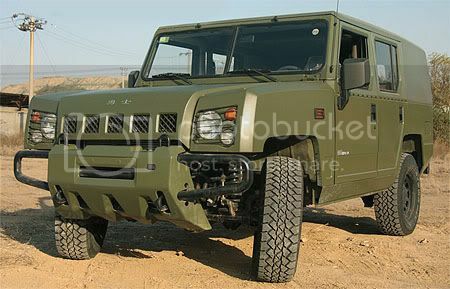 Hence, some say the Yongshi is loosely-based on the Jeep Cherokee. 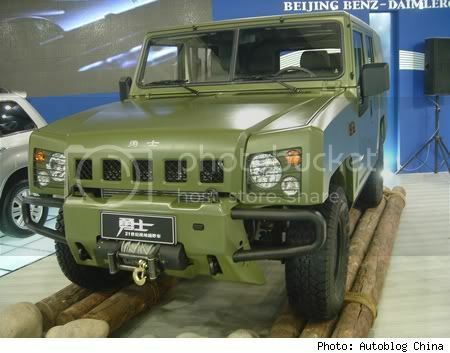 That aside, the first model appeared in 2005, and the PLA undertook several years to trials before deciding to purchase it around 2007. The original order was supposed to be for 2,100 vehicles, but more have likely been purchased, especially if the PLA claims the BJ2020 has been phased out of service. 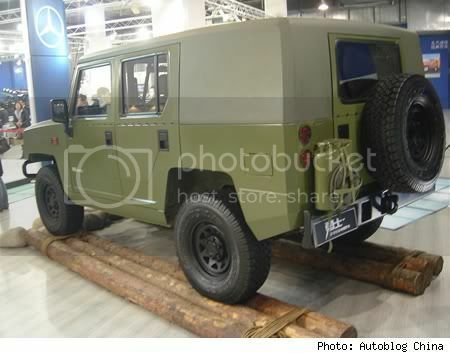 There are two versions of the vehicle: the 0.5t and the 0.75t long-wheelbase versions with five and eight seats respectively. 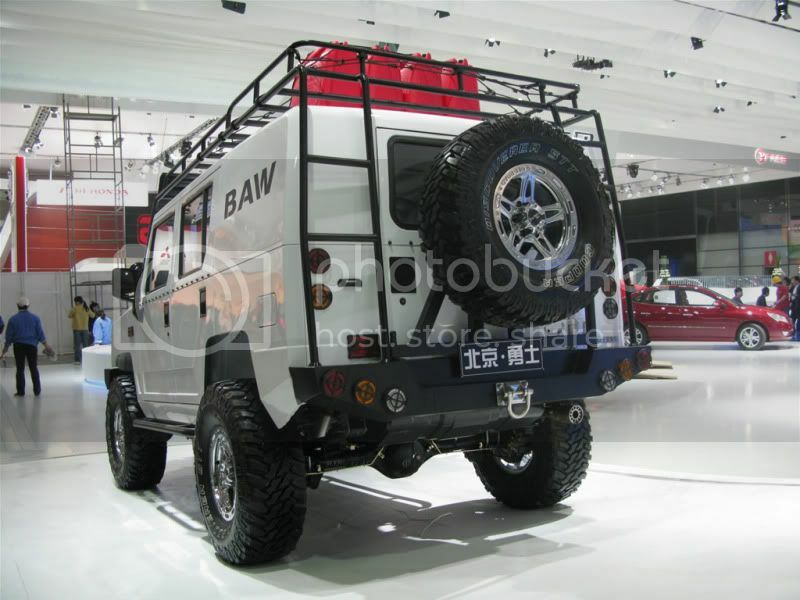 The rear section includes a sturdy roll-cage and a rigid cover can be fitted. A winch can also be added to the front of the vehicle for recovery. 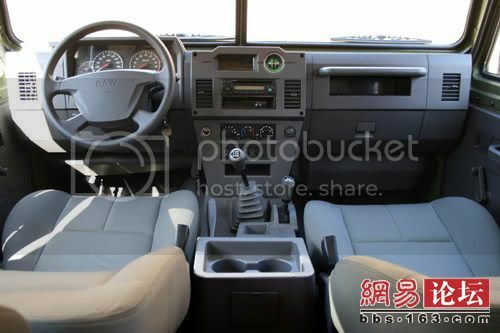 As far as I can tell, the interior is the stock-basic BAW version, and looks kind of like a 1990s Land Rover Defender. A GPS and GLONASS system are available, and the vehicle is kitted-out to receive military radios of various kinds (up to two) depending on the mission/deployment/user. The carrying and towing loads are 500kg and 750kg for the 0.75t version. Under the hood is a 3.2L (or 3,153cc) turbo-charged diesel intercooler with five forward and one reverse speed handled by a manual gearbox. The top speed is around 90mph using 136 horsepower. The manufacturer claims that the vehicle can start within twenty seconds at -30 degrees, and with some assistance in forty-five seconds between -30 and -45 degrees. Fuel efficiency is said to be 6L/100Km, and the max range is supposed to be 1,000Km. For such a small vehicle (the frame will sit in your palm easily), the box is fairly big and well-packed with stuff, some of it protected with cardboard and bubble-wrap. Like many civilian car kits, the sprues are different colors. There is also a fairly generous clear sprue with windshields and lights, etc. Sprue A: Besides the frame of the Yongshi, these are the only other green pieces, and contain most of the outer surfaces. Half of the body of the front bull-bars (part A9) is wrongly labelled “6” on the sprue. There should only be one A6, and that is the hood/bonnet of the jeep. That aside, the parts are quite nice: the hood is well-cast, as is some fine detail on the bull bar bodies and windshields. Sprue B: This is the first grey sprue in the kit, and comprises the seats, solid rear roof and the roll-cage/frame. The seats have decent detail and the rear roof is a nice one-piece mould. Sprue C: This is the second grey sprue, and contains most of the vehicle interior. Here I caught myself making a comparison I shouldn’t have— I was comparing the dashboard and other interior pieces to those of a 1/24 civilian car kit. There is less fine detail in the dashboard and other interior parts because 1/35 is a lot smaller. Having said that (and having put that comparison aside), I took a closer, more considered look remembering what scale I was looking at, and for 1/35th, the interior is very impressive. 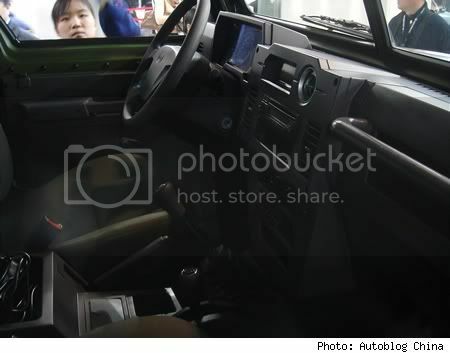 The dashboard is my particular favourite, with fine detail on the central console. 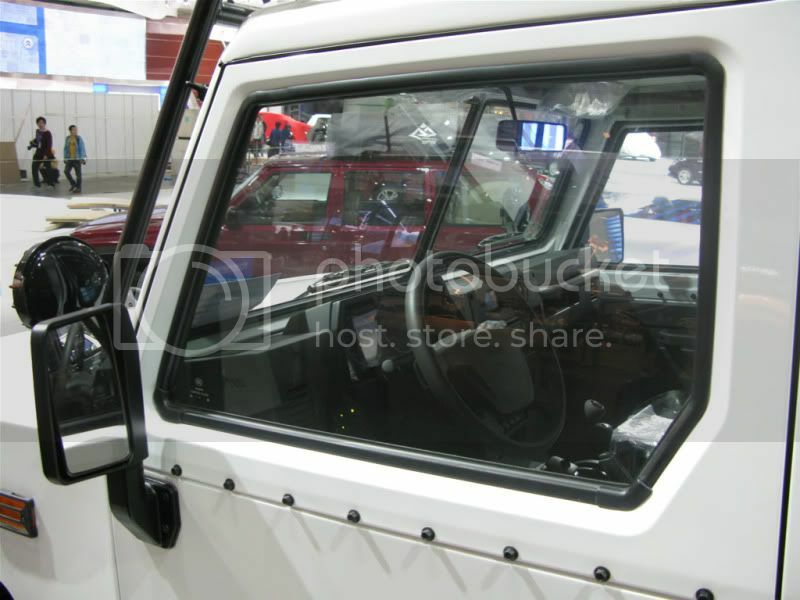 The air vents are nicely-recessed, and the inside of the rear & front doors are also nicely done with fine slide-moulded detail on the window winders and door handles. The gear-stick, gear-box housing and cup holders in the centre of the vehicle make up a lovely little piece. Number 6 on the decal sheet is the dashboard detail showing the speedometer, etc. This is not called-out in the instructions, however, so at Stage 16 remember to put the decals on. Sprue D: This is another little gem of a sprue, the first black one of the kit. We get the four wheels and spare wheel hubs, which are quite small, but flawlessly moulded and solid. We don’t get a fully-detailed engine in this kit— more like two halves, bottom and top, spread across this sprue and sprue E. Sprue D contains the main drive-train, exhausts and radiator, as well as the front light clusters, radiator, disc brakes and foot pedals. Sprue E: Also a nicely-detailed cluster of parts, this one contains the under-frame, axles, suspension and another little masterpiece of slide-moulding: a drop-in engine bay, which will look very nice painted up. Sprue F: There isn’t one; we skip to G.
Sprue G: This is the clear sprue, and it is very nicely-done— windows & lenses are admirably thin and flawlessly-cast. The sprue is protected with some polystyrene paper. Photo Etch: The PE is rather thick— at least compared to Eduard. This doesn’t really matter, though, and the parts included are top-notch. These include the mesh behind the front grille, the disc brakes, rear light frames, front light frames, hood grilles and some mesh parts for the interior doors and rear trunk/boot hatch. There are also a couple of hooks and some other small detail parts. 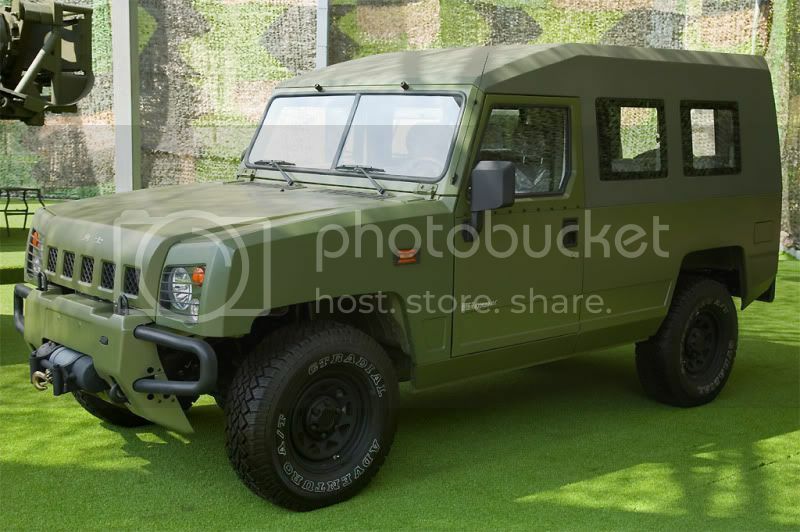 Sadly there are no etched seat-belts, which I think is a bit of a problem if the vehicle is displayed without the roof. As is usual with Hobbyboss the instructions are well laid-out and not too busy on the various stages. There are 23, 24 or 25 steps, depending on which parts you decide to add at the end of the build: the side and rear windows are optional, as is the hard roof. There are two wrinkles to the instructions as well: the front cover reads “Yongshi SUV 1.5t” when it should be “0.5t” as it says on the box cover. Also remember that the dashboard decals are not called out when they should be in Step 16, so remember to install them there. The decal sheet is quite large for such a small vehicle. This is because there are six different finishes you can apply, each with their own markings. There are also generic plate numbers, and individual license plate numbers and letters allowing you to custom-make a license plate. Decals are also supplied to outline in white the writing on the sidewall of each tyre. Some interior decals are present, and the exterior badges are particularly fine examples. 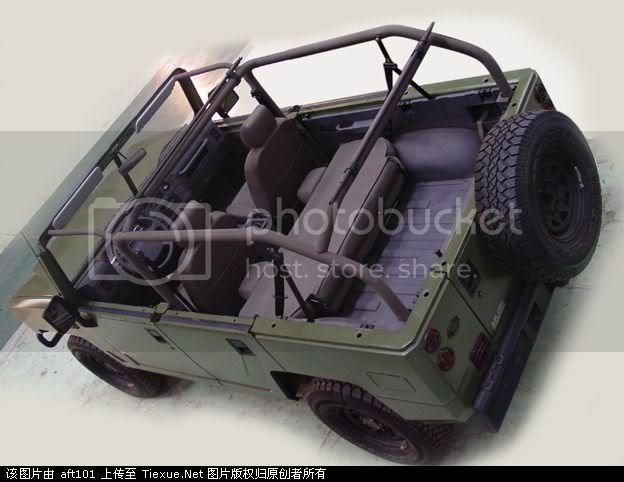 Option I- This is “PLA General Camouflage,” a kind of Russian green or light olive drab for the body and a darker green for the hard roof. 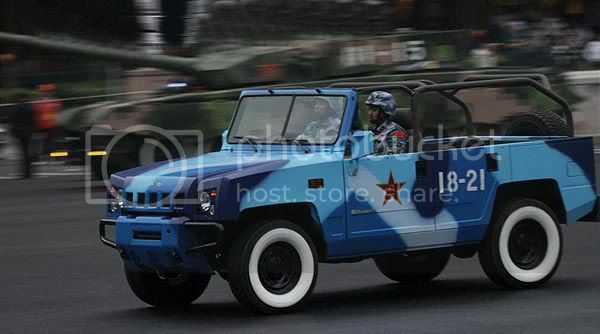 Option II- This depicts a vehicle from the 2009 Military Parade in Beijing finished in the PLA digital camouflage with whitewall tires. 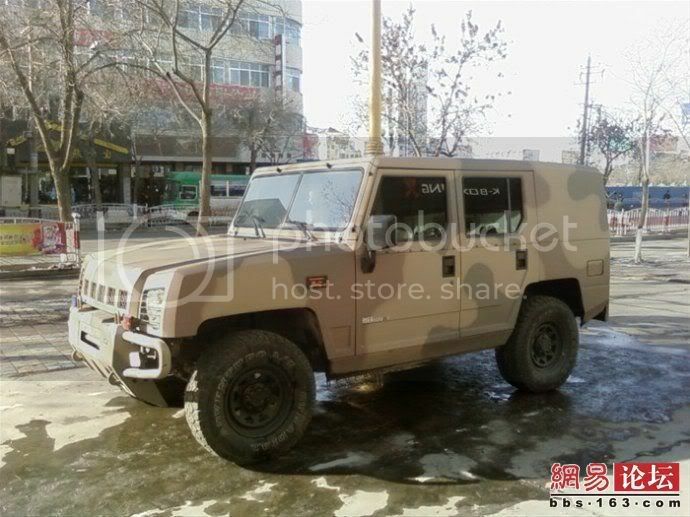 Option III- This is the standard PLA Ground Forces three-tone camouflage depicting a vehicle from the 2009 Parade with whitewall tires. 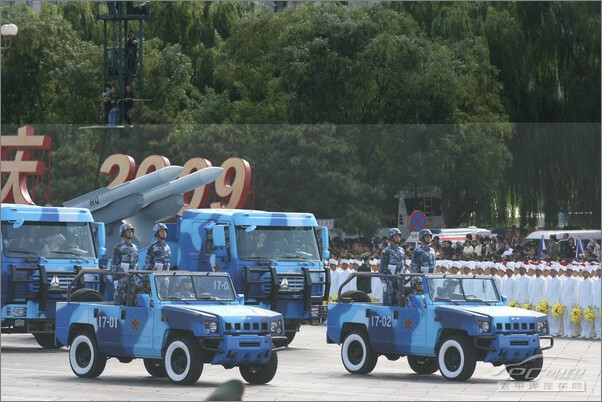 Option IV- Perhaps the most interesting scheme of the lot, PLA Navy Ocean Camouflage is a blend of blues and light grey to create a very unique scheme seen on some vehicles at the 2009 Parade known as Type 99 (99式海洋迷彩) in the uniform version. I was waiting for Hobbyboss to release a vehicle that would use this camo, and I can’t wait to try it out. Option V- A case of bad translation here I’m afraid: this scheme is called “PLA Hungriness Camouflage” in English on the marking sheet. 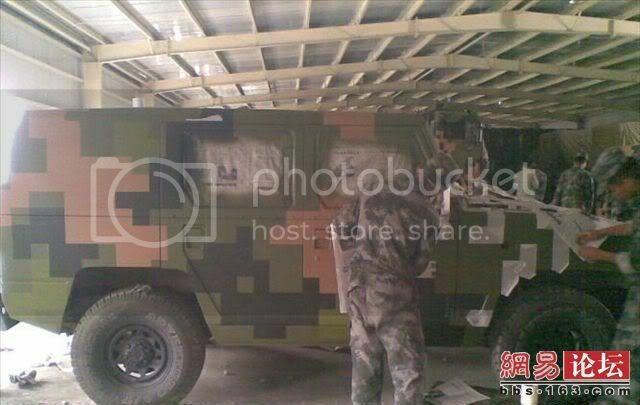 It’s actually the vehicle-based version of the Chinese Type 03 Plateau Camouflage (03型高原迷彩), which looks somewhat like Desert Flecktarn in its uniform version. 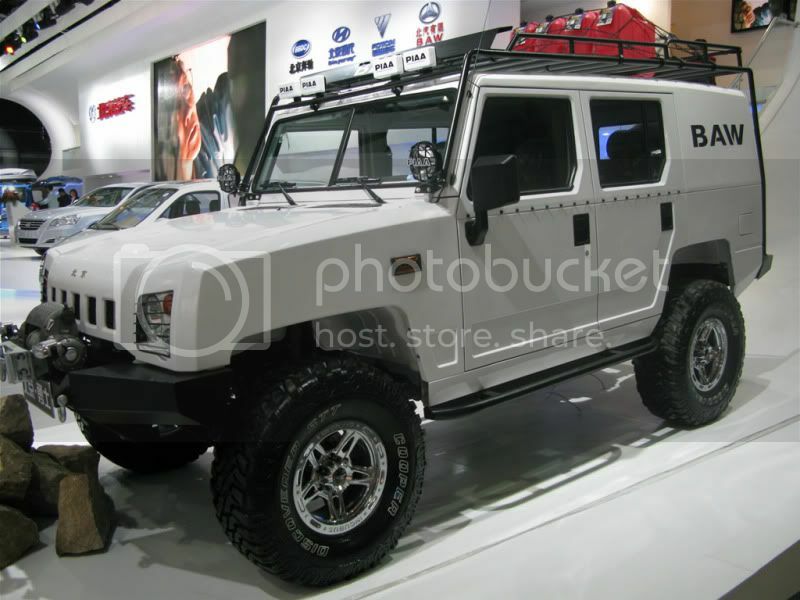 Option VI- Last but not least, we have a UN Security Force vehicle in United Nations White. The marking instructions do not say where this vehicle is based. The Chinese have participated in several UN peacekeeping missions, including Lebanon, Liberia, Congo and Darfur. The only problem with the decals is that no metal transfer versions are included for the vehicle badges. These are solid metal, and stand out a little on the real thing— just like they would on most cars. However, even some 1/24 car kits provide only the flat decals, so it’s not that much of a big deal, though it would have been a nice touch. 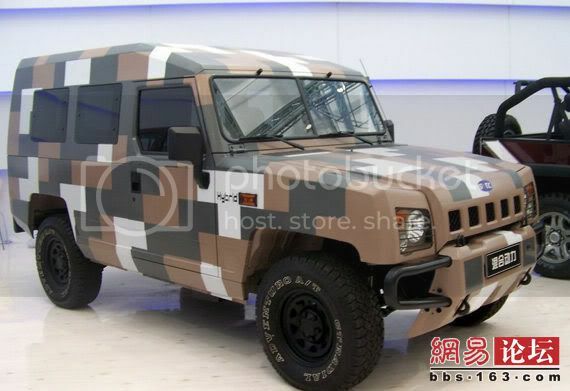 This is perhaps not the most glamorous or recognizable of military vehicles, and I think it is geared more towards the domestic Chinese market than overseas kit sales. 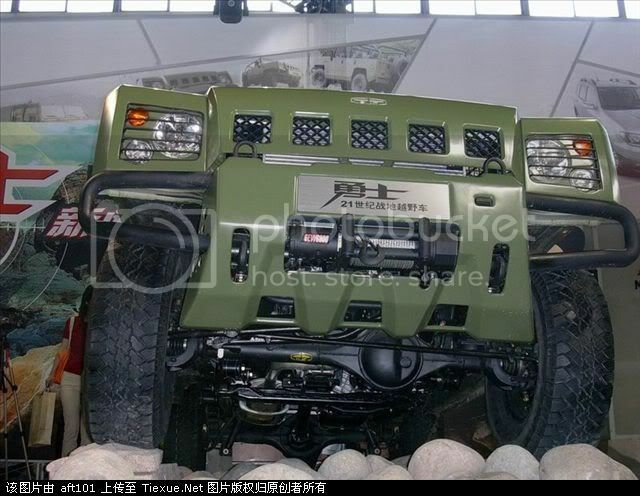 That being said, there are modellers out there like myself who appreciate these Chinese vehicle releases and this, in my opinion, is one of the best thus far. The moulding is crisp and solid, there is very little flash and the detail is top-notch. The Photo-Etch is generous, the decals are nice and the colourful & detailed paint schemes are very eye-catching. In fact, I will probably end up building more than one of these vehicles so I can try some of the different schemes. Problems are mostly relegated to a lack of seat-belts, instruction errors, but they present no big problems. My only other criticism is of the English description of the vehicle on the left side of the box: it is not very good at all, and could do with a bit of finessing, although that’s a very minor thing and does not detract from the kit in any way. Even if you are not a fan of Chinese vehicles you should definitely consider this kit as a change of pace. Now, I wonder if this sells well, will Hobbyboss be announcing the tooling of the Dong Feng EQ2050? 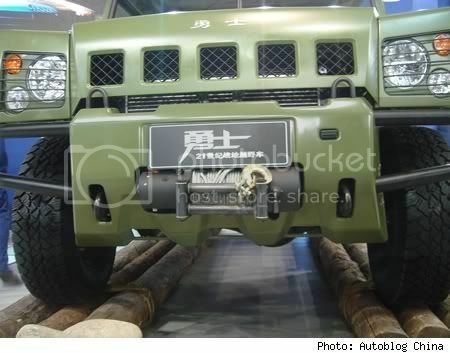 The Chinese Hummer would certainly go nicely beside the Chinese Jeep! A Build Log has been started in the forums. Highs: Nicely-detailed interior, fantastic slide moulded drop-in engine, lots of nice clear parts and generous photo-etch, plus some great paint schemes to try. 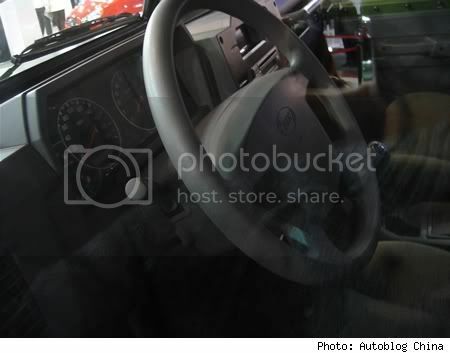 Lows: A lack of seat belts is the main flaw and there are also some instruction errors. Verdict: Overall this is a nice kit of an interesting vehicle with a good deal of detail in a small package. Bill, Hisham, Russ, Sean, Dave, Olivier- Thanks to you all for the kudos, much appreciated ! 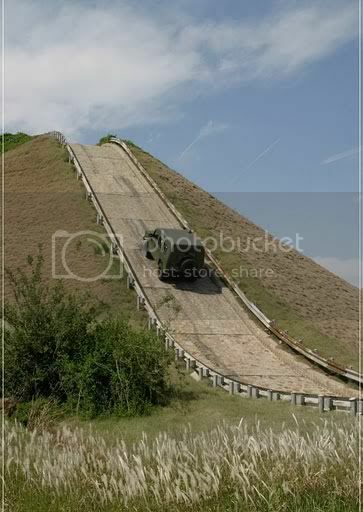 Bill- The PLA were copying (sometimes with licenses) Russian military pieces for a long time but then they, in some ways, went down their own road and distanced themselves from overtly Russian designs although more often than not the basis for much of their current military hardware is Russian. They do have their own ideas and designs based on their own interpretations of Russian and Western tech. They currently have projects running for new helicopters, refuelling tankers, transport aircraft and a laundry list of other things from ships to guns- indigenous designs are being pushed like never before. Personally, I'm just glad of releases like the Yongshi! 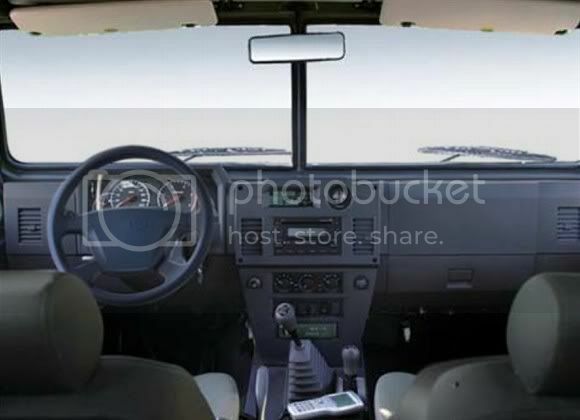 Hisham- the ET set looks quite nice- it would be very useful just for the seat-belts alone. Plus- the MG conversion picture you posted is cool- I also hope they plan variants for this. Bill- thanks for the pronunciation lesson, always useful to know these things! Also- I have some good references of this vehicle in various camo schemes, plus some interior views and one or two of the civilian version. As soon as I get some minutes to spare I'll put them up. 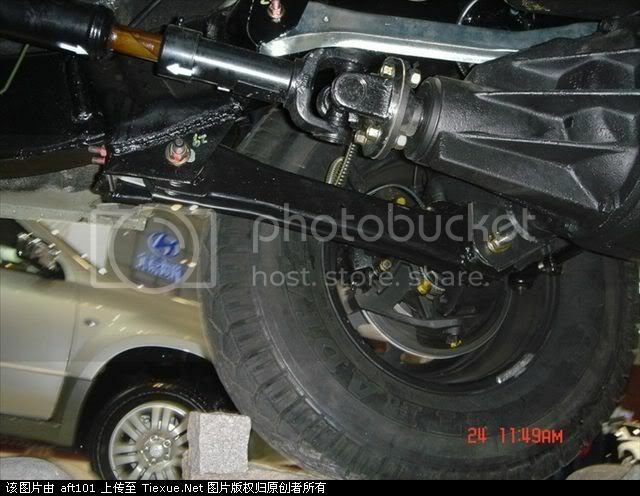 I found some decent shots of the underside of the Yongshi showing nice suspension detail and the various colors etc. If anyone wants them just shout. A build log for this is imminent, today or tomorrow and I'll put the link up here. Its falling together so far ! Hisham- I'll post what I've gathered so far along with a few other reference pics. I'm still looking and if I get anything else worthwhile I'll stick it up here. 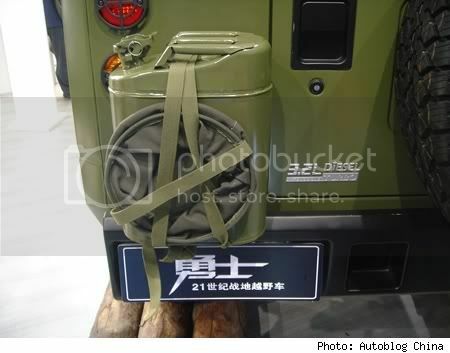 Underside: Engine Bay: Centre Console Detail (Bill- could you translate the chinese in this picture, I'd like to kno what it says): Ocean Camo Yongshi: Thats all for now.